The wood is an old and reliable material. Its main features are naturalness and comfort. Window wood is a specially glued so its resistance to the deformation meets the strictest standards for Germans wood production rates. 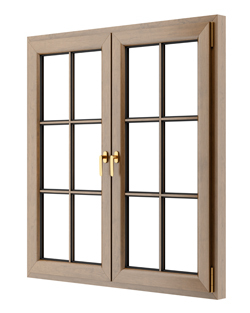 Wooden windows are adaptable for the needs of different customers, architectural styles. The wood can be varnished with a more than 20 shades of lacquer, painted in more than 200 colours or covered with aluminium lids, which can also be painted in various colours or anodised. The interior and exterior is possible to varnish or to paint in the different colours. 68 mm profile from the wood which was selected by customers. German„Siegenia AUBI“ lacing fittings with a soft lacing and have an additional micro-ventilations position. Glass packet with a selected glass from the worlds leader of manufacturing glass „Saint Gobain”. 78 mm profile from the wood which was selected by customers. Because of thick frame, mostly it is mounted with a 3 glass package. 84 mm profile from the wood which was selected by customers. 3 glasses 44mm thick package with a selected glass from the worlds leader of manufacturing glass „Saint Gobain”. Wooden profile, from the customers selected wood. Danish lacing fittings which has a special antique design. Glass package with a selected glass from the worlds leader of glass manufacturing „Saint Gobain“. Can be a plastic frame in a glass package, protects the edges of the glass against fading, extending the time of wood and keeping the warm up. Extremely large dimensions, a very thick wooden frame terrace doors / windows with sliding doors in the floor. It is the thickest terrace doors / windows, which are possible be made of wood. Using a special window fittings, plastic windows or doors can be folded like a harmonic. The use of such a sliding system, allows the maximum use of the area occupied by the product. The SAS wooden windows of new technologies are suitable both for modern designed home and for historical heritage buildings.